Do you remember when bands used to play live on radio stations? Back in the day, and I'm showing my age here, bands would appear on late night FM stations in America and put on a 'live' concert over the airways. 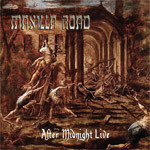 Shadow Kingdom Records release of Manilla Road's After Midnight Live is exactly that, and more. Recorded in 1979, before their first release Invasion, this disc shows Manilla Road at their fledgling yet upcoming best, before they became legends of epic heavy metal. You can hear classic 70's rock, doses of Hendrix and Clapton in the guitar work, and strong hints of what would become some progressive and epic metal. Every band has roots, and listening to After Midnight Live you become a witness to the early genesis of Manilla Road. This disc will put later material, like Crystal Logic and Open the Gates, in better context for fans and students of early American hard rock and heavy metal. To the latter group, I would say jump on this recording. Rarely do we have access to such important history. Yes, the early stage of Manilla Road is important, but also the context of playing live on radio. Even the DJ's segue is included after the second song, and later at the conclusion of the set. This primo historical stuff, and very fine Manilla Road. Strongly recommended. After Midnight Live is classic Manilla Road before their first album and before they became legends of epic heavy metal. Better, it was recorded live in a radio station for late night listening. Do you remember?